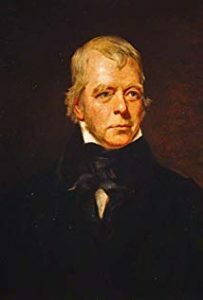 Sir Walter Scott, in full Sir Walter Scott, 1st Baronet, was a Scottish novelist, poet, historian, and biographer who is often considered both the inventor and the greatest practitioner of the historical novel. Scott’s father was a lawyer, and his mother was the daughter of a physician. He became a voracious listener and listener of Scottish history and historical poetry and romances and often recited them for his relatives. Moreover, he explorated the neighbouring countryside, which developed in him a love of natural beauty and instilled a sense of deep appreciation of the historic struggles of his Scottish forefathers.He was educated at the high school at Edinburgh and later, in 1786, he was apprenticed to his father as writer to the signet, or an attorney. He couldn’t be persuaded to read and practice his profession for he was enamoured by writings in Italian, Spanish, French, German and Latin. He got married to Charlotte Carpenter, who was of a French royalist family, with whom he lived happily until her death in 1826. Scott became interested in German Romanticism and Gothic novels, and Scottish border ballads, whihch led to him publishing and delving into writing ballads. His first successful poem was, The Lay of the Last Minstrel, which ran into many editions. Scott led a highly active literary and social life during these years, during wich he published many other poems which showcased his highly literary Scottish storytelling style, clear diction and engaging prose. But by 1813, Scott had begun to tire of narrative poetry. Moreover, his poems were threatened by the greater depth and subjects of Lord Byron’s narrative poems. In that year itself, he rediscovered the unfinished manuscript of a novel he had started in 1805. He finished the entire novel in a summer, which came to be titled, ‘Waverly’. It came to be recognised as a literary success. Scott proved to be a born storyteller and a master of dialogue. He was an insightful historian, who had a deep knowledge of Scottish history and acutely observed its mores and attitudes. He followed up Waverley with a whole series of historical novels set in Scotland. These are now known as the “Waverley” novels. After these novels, Scott turned to English history and wrote novels which were: Ivanhoe,The Monastery, The Abbot, The Pirate, The Fortunes of Nigel, Kenilworth, Quentin Durward. Scott’s immense earnings in those years contributed to his financial downfall. He got into a huge debt involving purchase of his own estate and the great financial collapse of 1825 caused him to go bankrupt. The strain on him to pay back his debt shortened his life. In 1827 Scott’s authorship of the “Waverley” novels was finally made public. Unfortunately, in 1831 his health deteriorated sharply, and died in 1832.